DJ Morphine vs. DJ Taa. 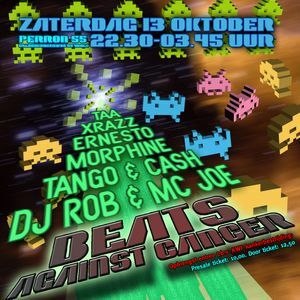 3 Hours Houseclassics Liveset @ Beats Against Cancer Part 2, Okt. 2012. Age Of Love, C.Y.B.E.R.F.U.N.K., The Prodigy, Tellurians, Xu Rui and more. In Oktober 2012 we had the second party in honor of our friend Barry, who passed away on this horrible disease. Our goal is to keep remembering him through the thing he loved most: House Music. This set reminds us all to do what we need to do: party and reminiscence our loved ones! Enjoy....! And see you at the next edition.